Music and Led Zeppelin were the heart of Alisha and Erica Anderson’s wedding at the Merv Griffin Estate in Palm Springs. Their long-distance courtship between Alisha’s London home and Ericka’s Los Angeles base was defined by music—from old-school mixed CDs sent via snail mail to sharing links of favorite songs via text. During one of their exchanges, longtime Led Zeppelin fan Erica sent Alisha the link to Zeppelin’s “Thank You” with a note saying someday this song would play at her wedding. So when it came time to plan their day, it was a given that the song would play a pivotal role. 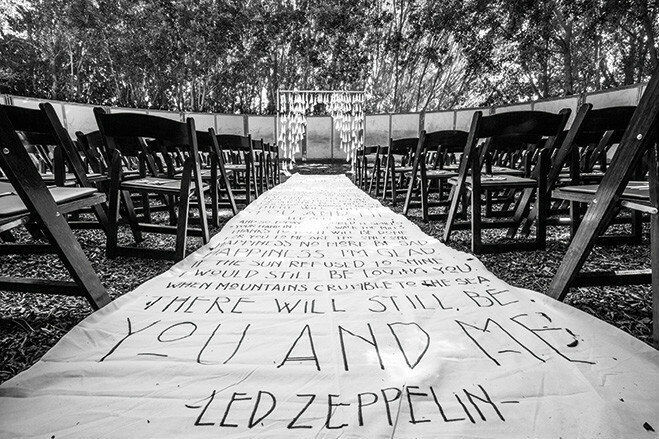 Jesi Haack Design artfully infused musical moments into the decor by creating a ceremony arbor made from cones of music sheets, dotting the estate with vinyl records and unfurling the piece de resistance, an aisle runner with the lyrics calligraphed by Blot and Dot. Adding romance to the night, Alisha surprised Erica by debuting her newly learned guitar skills as she performed her rendition of “Thank You” to cap off the night.